Banstead Botany Blog: Powder-blue alien! Work and holidays means I have not had much time to get out and about locally recently and so not had anything to write about. However that changed yesterday whilst gardening when I happened to spot this little aphid on a leaf! I think it is the craziest thing I have seen in years. At first I thought it was dead and had been infected with a fungal parasite but once I had got the camera, it naturally started walking away and it took me a while to get a picture. Apparently one of the wings is damaged and I still suspect it has some disease. 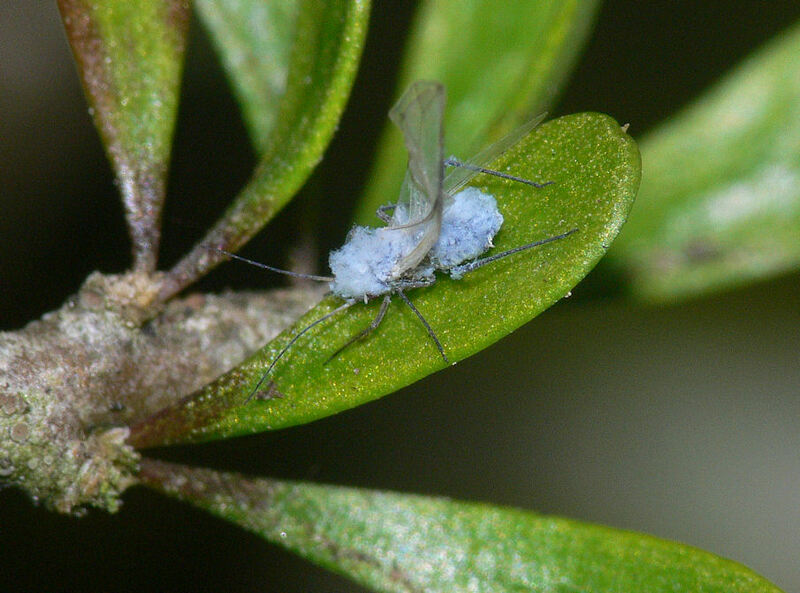 A quick Google for woolly aphids did not come up with any of this colour and believe me the colour is right. So: is there anyone out there who knows what it is? If not I will have to post it on the Natural History site, perhaps I'll do that anyway. I did and it is Phyllaphis fagii (Beech Aphid). Apparently quite common, I shall have to look more closely at the aphids!